Thread: What a way to end the year.. I had just settled down to spend New Years eve relaxing in my comfy PJ's when a friend let me know she hit an owl with her truck. It was out cold as she picked it up, but then came to. She was sitting on her front porch with it nearby. It kept an eye closed and seemed stunned. She asked me if she should put it into a tree. I told her I was going to come and help her catch it and put it somewhere safe. While it couldn't fly, it would stress and try to scamper away when approached. I have never been to her new place which is out in the boonies. So..night blind as I am..off we go with my trusty kitten rescue Box. Talk about dark and rainy roads with a bunch of idiots out and about. Small town as we are, we do have a wildlife rescue and thank God they returned my call. I knew they would want to take the owl, no matter what day or time. We caught the poor bugger and off to find the home residence of that wildlife rehab center. Here it is at the rescue and after its exam. A quick no flash pic before leaving it in good hands..
Re: What a way to end the year.. Sorry to hear about the excitement to close out 2018, but so cool that you took the time and made the effort to help. Here’s hoping for a full recovery for the little fella. Just as long as he makes it !!! Then it will be the best spent New Years eve I had. I LOVE owls !!!! well, even if he doesn't make it. At least he is not out there in the rain, mauled by cats, dying a slow death. I love owls as well, incredible birds. 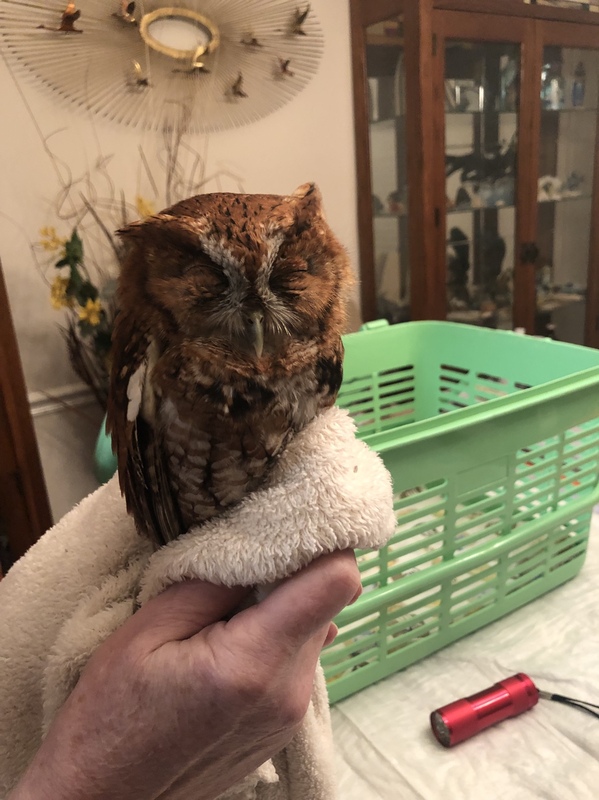 Is he a screech owl or did the rehabber say? He looks similar to ones we had living near my house when I was growing up. And agreed that it was best for him not to be left outside subject to the elements and predators. You did a very good deed there. I hope you are able to find out how it did and update us. I'm so glad you could help that owl...I love them too, I hope he recovers well. Its a screech owl, yes, quite small. Yes, they will update if you want to be updated. Not everyone does, because sometimes it doesn't end well. So far all but one animals I brought them made it. One I didn't actually bring to them, I had them meet me on the side of the road. A buzzard was hit by a car and it sat near the road. You could tell it was bad. Wing was obviously broken and held away from body at awkward angle. I stopped and slowly went near it. It absolutely tore up my heart, because fire ants were getting to him. He would just lay there looking near death, but if I got to close, he would try to hobble away. I got him away from the ants and then just sat nearby waiting on the guy from the rescue. He came with a carrier, blanket and big gloves ( I had NOTHING with me). He said right away doesn't look hopeful. The buzzard didn't make it, but at least he wasn't killed by fireants. Those things are the devil. As weird as people think I am for my love of legless slithering animals. They should talk to me abou my love of birds. What a great outcome.